One week after the Typhoon Sanba wrecked havoc a new edition of BGB and GBG was held. 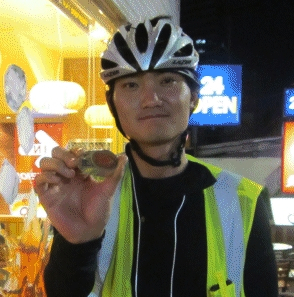 On September 22 seven riders mounted their bikes at Han's bike shop at 06:00 and headed east to the port city of Busan. At exactly the same time three riders took off from Busan and headed west to Gwangju. This time the weather cooperated and Randonneurs enjoyed cycling through Jeolla. Also rain showers had been forecasted for Sunday, the day turned out to be sunny with perfect riding temperature. The aftermath of Typhoon Sanba caused some challenges as the Nakdong River had carried high water and some roads and most of the bike trails along the river, had been flooded and thus leaving plenty of mud behind. A section of the trail along the Nakdong river was closed and this caused twice a detour of 7 km. Making things worse, the detour was leading over a mountain and this resulted in two times 250 m extra climbing meters. Nevertheless, everybody made it within the 40-hours limit, except one rider who had to stop after 235 km due to physical problems.